Today was my first proper day of half-marathon training. I started with an early morning run, 6.5 miles, from King Alfred's to the Marina and back. The longest distance I'd run before was 4 miles so I was quite pleased to manage come back in just over 55 minutes. At last night's event I was talking with someone about running and they said they found it boring. They'd heard people say it felt good, but couldn't imagine that. I always felt the same way but I've found that, once I've managed the first mile, I'm carried away by the rhythm of running. It's a different feeling to anything else I know. After a quick shower I visited the Run shop on Blatchington Road to buy a new pair of running shoes. These should be more suitable for my own feet and will hopefully prevent any damage as I work on longer distances. The fitting process at Run is quite involved, including video analysis and test driving, but I came out feeling very happy about the shoes I'd bought. Hopefully I can try them out properly on Sunday when I'm back in Coventry. I'm continuing to enjoy the fitness sessions but I've been looking around for something to train for. At the weekend my cousin mentioned the Cross-Bay Run, a half marathon across Morecombe bay. I have about eleven weeks to build myself up to the distance but I have no fear. I ran the Santa Dash, a three mile run along Brighton seafront in the rain. Thirteen miles through the sands of Morecombe bay? Piece of piss. But I'm going to train hard, just in case. So much of what I read is forgettable. There are whole novels from which I retain nothing but an impression of like or dislike. I recently found an online copy of a short story I remembered from when I was twelve, Light of Other Days. It's even better than I recalled. Brilliant article on the last 10 years in literature. I don't agree with the predictions in the final section, but it's an interesting summary of the changes in recent years. Bookselling for Dummies – I wonder how much longer bookshops will exist on the high street? Brighton's Market Diner is being sold. I have some great memories of that place. I think I shall make a visit on Thursday night, after the Enchantment Under the Sea dance. The Guardian on Britain's thriving poetry scene, an article which discusses none of the thriving areas of British poetry I know and enjoy. That so much is happening can only be a good thing for British poetry. I think I’ve mentioned that Coventry is the most inland city in the UK. Last night, lying in bed, I thought how lovely it would be to walk to the beach and watch the waves roll onto the sea. Homesickness can be a good thing though, because it means you have a home. Public transport on a Sunday is miserable. I left my sister’s house at 9:30 and won’t be home until 2pm. That’s four and a half hours to travel about 30 miles. By car it’s a one hour journey. Blaming other people gets me nowhere. Trains have been appalling on a Sunday as long as I can remember. I made a choice not to learn to drive but that now seems ridiculous. If I want to travel on a Sunday (if I want to visit anywhere on the weekend) I need to learn to drive. Otherwise I can stay put, choosing not to ruin relaxing weekends by ending them with the misery of rail replacement buses and waits in bad railway cafes. Now to kill the next 80 minutes looking round a mall. 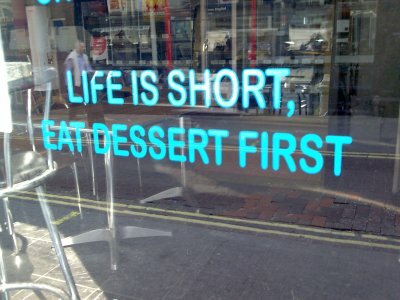 It’s hard not to conclude modern life is a waste of time. It’s been a good weekend. Saturday was slow – mostly. I started with a training session at 10am, which was fun. The grass was still damp with dew and looked beautiful whenever we had to lie on our fronts. My folks came for a visit then I settled down to watch a DVD. Thanks to a colleague at work I’ve now got a 3-month lovefilm trial, which started with Tideland. I’ve decided Terry Gilliam is a director I prefer reading about than watching (it’s probably not a good sign that my favourite Gilliam movie is Lost in La Mancha). I was up way too early this morning for my visit to London to celebrate Mr. Punch’s birthday. I picked up some interesting books and watched a few shows. The last one I saw disappointed me by ending with Mr. Punch being taken to hell by the devil – but I did see a baby fed to a crocodile. I resisted the temptation to buy the ready-to-go rig and set myself up as a professor. For a start, I’d prefer to make my own outfit. And I need to practise with the swazzle before investing the money. I crossed Londonn in the beautiful weather and met nwv at Tate Britain where she wanted to see the last day of the Peter Doig show. While the display was better than Iron Man, I always find painting difficult to respond to. There were some fantastic pieces, such as those inspired by Friday the 13th and his ‘Man dressed as a bat‘, a bold reinvention of the Batman character. Posted on May 11, 2008 Author James BurtCategories UncategorizedLeave a comment on London! For various reasons I won’t be down in Brighton this weekend. 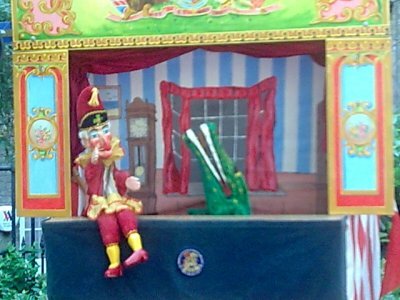 However, I do hope to make it to the Covent Garden Puppet Festival and May Fair on Sunday. 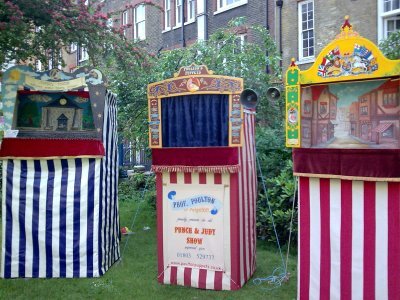 The event is held annually to celebrate Mr. Punch’s birthday, and features a church service with a reading by Mr. Punch himself. Getting to the festival is likely to be a chore. I checked the train times and reaching Euston for 10am requires leaving Coventry at 10:21 the night before, which means a bus journey is in store (and this is actually the normal Sunday service). I’m determined not to miss this, despite the failings of public transport. If anyone fancies meeting me in London for coffee and puppets on Sunday, drop me an email or comment.